While our third Stunning Style is a perfect look for a day like Halloween, today’s style shows a different ensemble you can pull together around the same top that’s a bit more casual, but still full of geeky style. I picked up this awesome Batman logo shirt from Hot Topic. It’s not only flattering on the body, but its flared cut sets it apart from the standard t-shirt. You could also make a shirt like this yourself by following Lindz’s shirt painting tutorial. These shoes are made by Converse Journeys. What I love about the Journey DC Comics shoe line over the shoes by Reebok and Adidas is the fact that they actually list these shoes in sizes for Men AND Women. 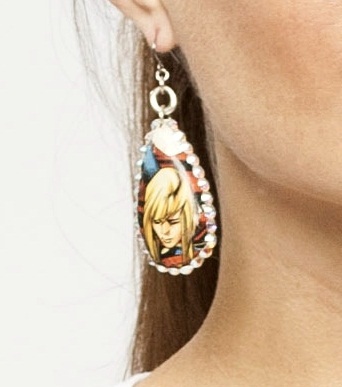 Plus, instead of being a shoe design inspired by an outfit or character, they’re mini-comic book works of art! 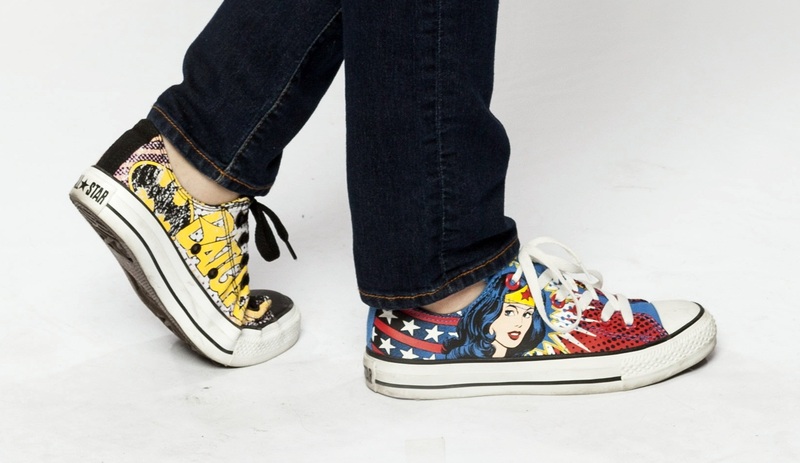 I loved the designs so much that I couldn’t pick just one and bought both the Batgirl and Wonder Woman pairs, and wear one of each. You can decoupage just about anything and turn something plain and boring into something geek chic! 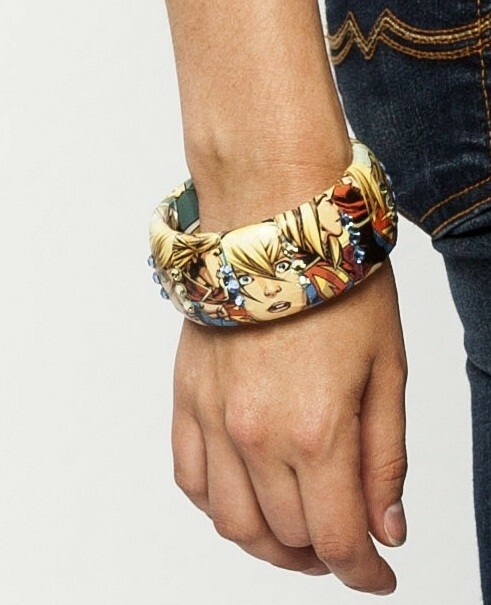 Similar to my decoupage shoe tutorial, I took some comics and decoupaged them onto a bangle bracelet and a pair of earrings that I had picked up on clearance at Target. Target is always putting jewelry on clearance as they change their fashion seasons, and it’s a great way to get jewelry supplies at a low cost that you can geek up later! We here at Set to Stunning wish everyone a safe and fun Halloween! We’d love to see what stylish geeky decorations and/or outfits you might have put together to celebrate the season. Please share with us on our Facebook!